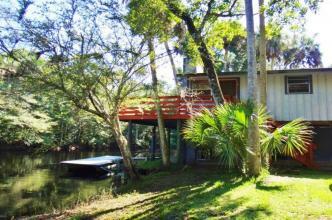 A two bedroom one bath Waterfront Vacation Home in Edgewater--Minutes from New Smyrna Beach, or Mosquito Lagoon by Boat. Deep-Water, Canal Front Home off the Indian River in Edgewater (Oak Hill area), minutes from the best Intracoastal Waterways of Mosquito Lagoon. Dock and davits, deep-water canal. Some of the best Reds fishing in the world! Shrimp lover's paradise! Step out the backyard and in minutes have your boat on the Indian River in the Mosquito Lagoon ready to make the catch of the day! Boat launching minutes away at well-known River Breeze Park launching ramp on the Indian River. The area is ideal for fishing lovers, beach and nature lovers, fishing, walking, and, of course, for a relaxing vacation. A true nature's paradise right at your doorstep! Also, minutes from New Smyrna Beach and Daytona Beach or one hour from Disney, Sea World, Universal Studios, and downtown Orlando. Within 30 minutes of the Space Coast. This lovely, fully-furnished vacation home to comfortably sleep six. Just bring your clothes and move in! Spend a week, month, or season! Do not forget the boat and fishing equipment! Refundable Security Deposit & Cleaning Fee Required - Please Inquire.